Accidents in the workplace can and do happen all the time, but they can be particularly life-changing if a lift truck is involved. There are thousands of accidents involving lift trucks reported every year. However, it's often those employees working alongside lift truck operators that tend to come off worse. The Health & Safety Executive (HSE) claim that around 57 per cent of those injured by lift trucks are pedestrians. If your business uses forklift trucks or other machinery, it is your responsibility to ensure the safety of your employees at work. As well as good health and safety policies, your business should also consider employers’ liability insurance in addition to your general business insurance. The routine and repetitive nature of a lift truck operator’s daily work means that concentration levels may drop and bad habits may develop in an effort to be efficient. Once this happens, a workplace can become a dangerous and risky environment. However, a new course by Mentor Training called Safely Working with Lift Trucks aims to reverse blasé attitudes by directly linking the consequences of lift truck operator’s actions to their love of family and friends, as well as their favourite activities outside of work, which may all be adversely affected if an accident did occur. The course highlights the power of peer pressure, too, so it’s important to think about safety culture in the workplace to encourage a shared belief among staff about the risks, hazards and accidents. For an example from the real world, take driving. When bad habits start to creep in, drivers are often held to account – by cameras and by the police – but no more so than by peers, who would point out dangerous actions because they themselves don’t want to be involved in an accident. 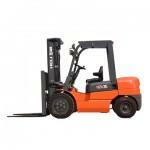 Therefore, it follows that the same culture of safety should be instilled in lift truck operations. Every single employee on site should therefore receive short, sharp and thought-provoking training on the many dangers posed by lift trucks and the best practices for avoiding them.